The renaissance of the famed Lincoln Douglas debates was held Saturday in The Woodlands, Texas north of Houston. Rather than the sound-bite world of 30 and 60 second responses to “gotcha journalism” that is promoted on televised debates, this one was very lightly moderated, the questions posed for discussion were substantive, and the candidates Herman Cain and Newt Gingrich) were given ample time to respond. The candidates themselves controlled the response time more than the moderators, (Ben Streusand and U.S. Rep. Steve King of Iowa). Only three broad topics were addressed. After the invocation by Jon Bauman, the Pledge of Allegiance led by local Boy Scout troop 889 and a retired officer of the Marine Corps, some introductory comments by Dr. Julie Turner, President of the Texas Patriot PAC, and a brief overview by Steve King explaining where the disastrous entitlement commitments are leading us (into the “poorhouse” or flat broke), the debate got started in earnest. As expected, for much of the time, both candidates were agreeing on main issues and skirmishing over relatively small nuances, as all conservatives agree that government waste is unacceptable, government inefficiencies are legion, and spending is way over-the-top and getting worse. Both generally supported main provisions of what has been called the Ryan plan. More taxes are a non-starter. Cain supported “patient centered, market driven” solutions. Gingrich blasted the philosophy of third party payer systems that put patients and insurance (or government) and medical service providers all against each other. Gingrich also hammered the idea of bringing business “best practices” (and outsourcing) to government programs to improve efficiencies and to “stop paying crooks” who routinely get about 10% of program expenditures in some states. Herman Cain showcased his experience in the business world while Newt Gingrich demonstrated his command of details of policy issues. This writer’s impression is we could use them both in the executive branch, not just either-or. Importantly, there was not any attempt by moderators or candidates to pursue “gotcha” agendas of any sort, and when both candidates pointed that out, there was loud applause. The American People and the Tea Party movements were big winners. Several attendees and bloggers had traveled hundreds of miles to attend and report on the event. Other absentee winners include Nancy Reagan and Laura Bush, both of whom Callista Gingrich indicated she admired and would model being a first lady after. Losers: Losers include President Barack Hussein Obama, Nancy Pelosi, Harry Reid, and in particular, the closed door meetings and secretive decision making that has led to such monstrosities as Obamacare, which likely had zero supporters in the cavernous auditorium in The Woodlands. The biggest “fail” of the evening has to go to the “mainstream media” themselves, for several reasons. They are biased, and in Herman Cain’s not-too-nuanced word, “dishonest”, a remark that drew some of the highest level of applause of the night (along with the call for photo ID for voting). They don’t get that the American people are sick of their manipulation and selective editing. Though nearly all networks were represented by camera crews representing over a million dollars’ worth of audio visual gear, NONE (not even Fox) carried the historic event live as did C-SPAN. They were only there in case one or both candidates really messed up somehow, so they could get a sound-bite out of a non-sound-bite debate. They don’t get that the American people are sick and tired of “gotcha journalism”. Even though reporters and bloggers were asked to respectfully stick to the issues relating to the topic of the night (entitlement reform), media representatives ignored this and went straight to the sexual harassment charges against Herman Cain. One leftist blogger sitting near this writer already had half of his report done before the debate started--on the harassment issue! In a real debate, such would have been disqualified. They are so obsolete (or terminally biased) to the point of reporting not the detailed and nuanced remarks themselves, but on the controversy of Cain parrying reporters out-of-bounds questions AND defending the media against Cain’s charges of being dishonest. Very little mainstream media attention was given to substantive answers. The “bloggers” room was given as good or better access to the candidates after the debate than the mega-mainstream-media, and had more interesting questions posed of the candidates in the more intimate and serious setting (unlike the media room, the blogger room was NOT looking to get “gotcha” quotes.) After the formally allotted times by the candidates, the blogger room was also visited for an extended and very candid discussion with Gingrich policy advisor Peter Ferrara, who was praised by both Gingrich and Cain and is the author of America’s Ticking Bankruptcy Bomb. As an aside, the best article this author has come across on the policy details thus far is by John Hayward on Human Events. 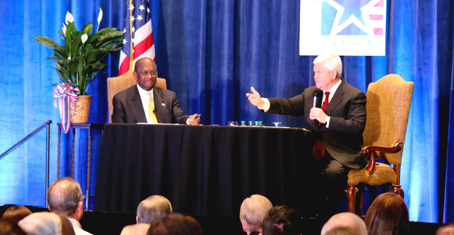 A preliminary transcript and video of the entire discussion between Cain, Gingrich and the moderators is on TexasGOPVote.com. Conservatives, Tea Partiers, and Americans in general owe a huge debt of gratitude to volunteers of the Texas Patriot PAC for demonstrating what a small group of committed individuals can accomplish. Special recognition and thanks to Dr. Julie Turner (President of the Texas Patriot PAC) and Suzanne Guggenheim (who started the Tea Party movement in The Woodlands, Texas).